My last project is finished and I am in love with it. It is from RichMore magazine # 128, 2016 and attracted me by its unusual construction and ribbing. 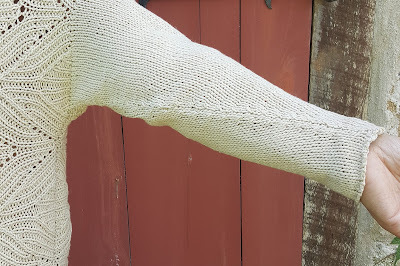 The ribbing pattern was easy and fun to make - not as boring as normal ribs are. After washing it really blossomed and looks like lace - light and breezy. The back and front are made simultaneously sideways. After making 1/3 of the top in one piece with increases for shoulder shaping I cast off one stitch in the middle and continued using two balls of yarn simultaneously, then cast that same stitch on and finished in one piece again, this time decreasing for shoulders. All calculations and numbers are given in the pattern and are very easy to understand even if you don't know Japanese (I don't). After finishing the body, I picked up stitches for sleeves and knit them straight gradually decreasing. The sleeves are supposed to be tight. At first I tried to use ribbing for sleeves as well but soon it was obvious that if I wanted to follow the directions, the sleeve would be too tight for me. So I decided to just stick with the pattern and wasn't disappointed with the result. The yarn is from Colormart. It is the same yarn that I got as a Christmas present from my husband some years ago and that I used for Cloudy (more details - here). It is hard to describe the yarn color - something between beige and oatmeal (maybe it is the same?). I didn't know if I had enough for the whole sweater but I figured that at worst it could be done with short sleeves and anyway it was worth the try. My gamble paid off. Not only I had enough for the long sleeves, there are some leftovers. One day I might combine them with the leftovers from the Cloudy cardigan and make something absolutely spectacular. Or not. Here is another picture of this project on me. 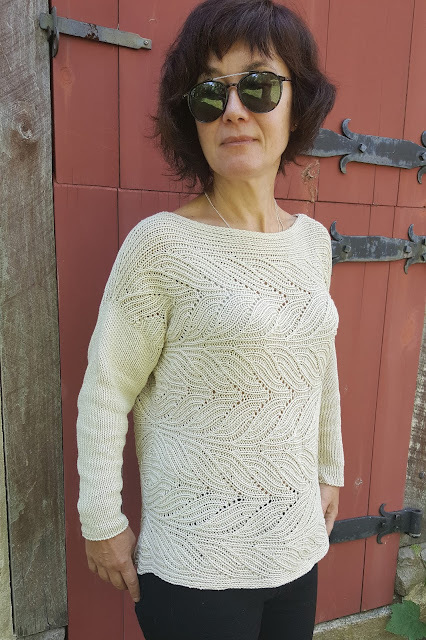 It is not form fitting, but the yarn, ribbing pattern, and construction together make it roomy without being bulky. And I love "roomy" when it is not bulky. It is easy to wear, especially in summer. More - on my Ravelry page. 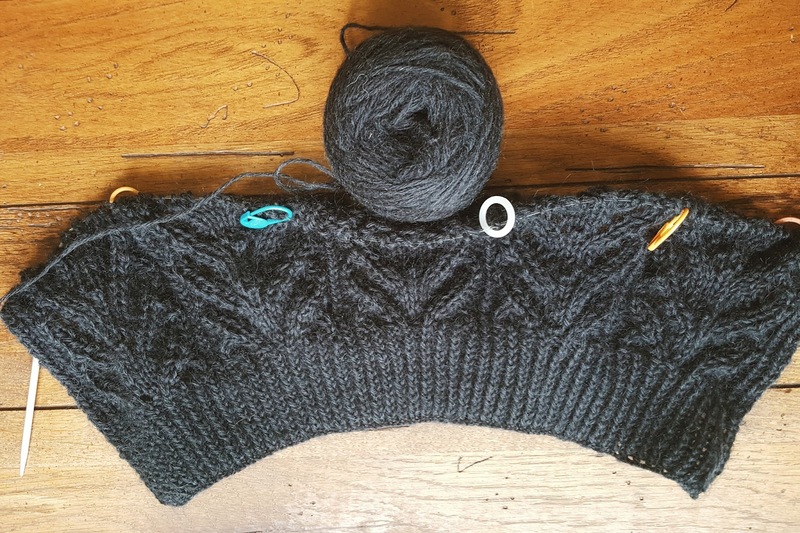 In other news I decided to participate in the Summer of Basics Make-along this year because... well, because I realized that some basics are missing in my wardrobe (I also think, that my kids wouldn't mind some basics as well). The plan is to make a simple garment first and then a more difficult, sophisticated variation of the same idea to see which one I like better. To start I picked Wolf River by Melissa Schaschwary. This is a lace pattern (and normally I don't do a lot of lace) adapted for thick yarn and rather big needles. I am using Rowan Kid Classic from my unraveled Echelon. Echelon was too big, long, bulky, and absolutely unwearable. One day it was unraveled, the yarn washed, rolled into balls, and stored. 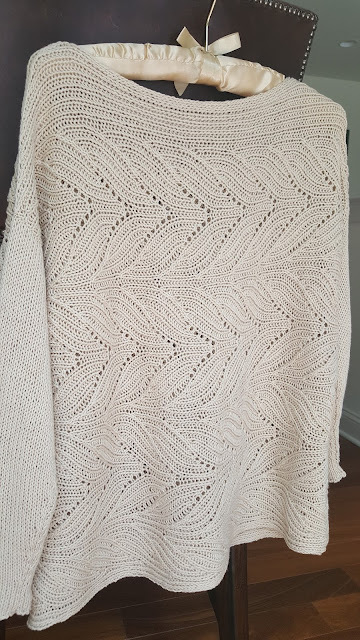 There is also a cardigan with zippers in my plans for this summer. Yes, zippers in plural. And yes, I am terrified because I've sewn a zipper in a cardigan once before and the experience wasn't pleasant. To fortify my resolution I bought a book with detailed explanations of how to insert a zipper in knitted clothes. If you know a good tutorial online about zippers, please let me know. I really need all the help and support that I can get. Any suggestions, recommendations, or just words of wisdom are welcome and much appreciated. In other plans some simple patterns from good yarn and some color work. I love planning my next projects, it is so much fun, right? Yet, I rarely follow my plans - so many distractions, new great patterns that call me like sirens. We'll see what happens. We are going back to Florida next week. Hopefully, it means more time for knitting.